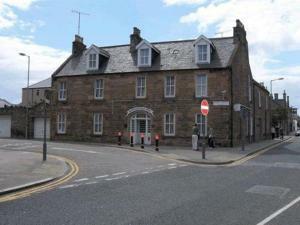 Choose from 5 hotels and guest houses in Moray. Shown below a just a selection of the hotels available. To search within an area please use the menu on the right. Southbank Guesthouse - Southbank is a Georgian town house in the middle of Elgin and the Whisky Trail. It is a few minutes' walk from the town centre's shops and restaurants. The guest house is over 200 years old and located on a quiet road. It is popular with those keen on golf, fishing, or seeking castles and malt whisky. Close by are the Glen Moray distillery, the Elgin Cathedral ruins and biblical gardens. Beautiful beaches are 10 minutes away where you may spot bottlenose dolphins or even a minki whale. Southbank is close to museums, Johnsons Cashmere Centre, and Baxters, where you can sample a local pancake. Norlaggan - We are a small family-run guest house situated in Speyside, offering quality assured bed and breakfast accommodation. We also have a well appointed lounge exclusively for the use of guests. Included in the price is our full Scottish breakfast. Its plenty enough that you probably won't have to buy lunch. Eastbank Hotel - The Eastbank Hotel is found in Rothes, right in the heart of the world famous 'Whisky Trail'. Surrounded by the most breathtaking scenery, the hotel is situated in the centre of the village opposite the church. Located in the heart of the world famous 'Whisky Trail' in an area of outstanding natural beauty, we provide all of the amenities for a pleasant Scottish holiday. We have an excellent selection of Malt Whiskies and offer bar lunches as well as bar suppers daily. The Speyside restaurant has captured the hearts of Eastbank's clientele, with its intimate atmosphere and outstanding cuisine. Its use of fresh, locally caught salmon and the best meat in Britain, has already earned it an enviable reputation from both locals and visitors alike. Heather Glen Guest House - A warm, family-run guest house, situated in a beautiful area half a minute walk from Elgin town centre. Quiet and peaceful are the hallmarks of Heather Glen. The Guest House is situated in the center of the beautiful city of Elgin. The area is famous for its golf courses, fishing in the Spey and the popular whisky trail. West End Guest House - Offering good food and warm Scottish hospitality, West End has a central location in Elgin and is well placed for shops, leisure, restaurants and attractions. The guest house is a traditional Victorian villa with a large private car park. It is also convenient for rail and coach travellers. The West End's excellent breakfasts feature local ingredients where possible, and will set you up for the day ahead. Enjoy specialty sausages, Stornaway black pudding and smoked haddock from Buckie. In the area you will find the Scottish Malt Whisky Trail, Johnson's Cashmere Centre, Baxter's Visitor Centre and numerous historic sites, including Elgin Cathedral.